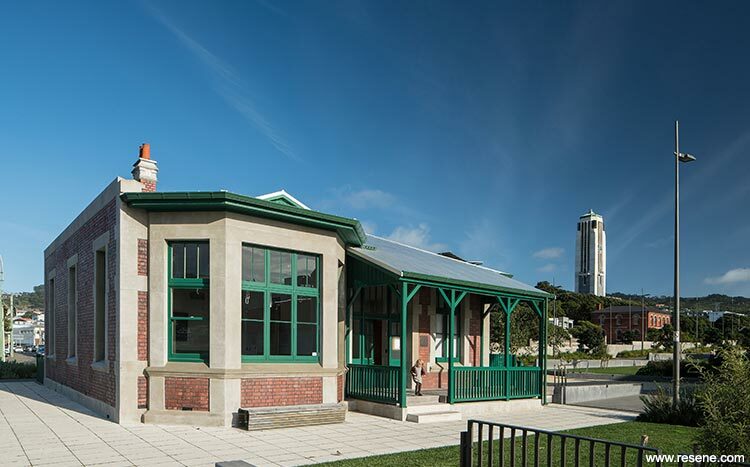 The Former Home of Compassion Crèche was built in 1914 for the Sisters of Compassion and is part of Pukeahu National War Memorial Park in central Wellington. Mother Aubert, the leader, is likely to become New Zealand’s first Catholic saint. 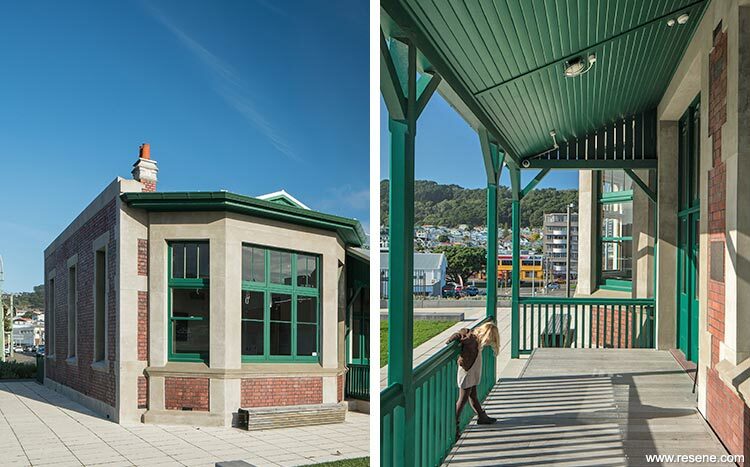 The building is the first purpose built crèche in New Zealand, and is designated Category 1 Heritage status. The initial project in included the strengthening, lifting, and moving of the creche, together with the external refurbishment. 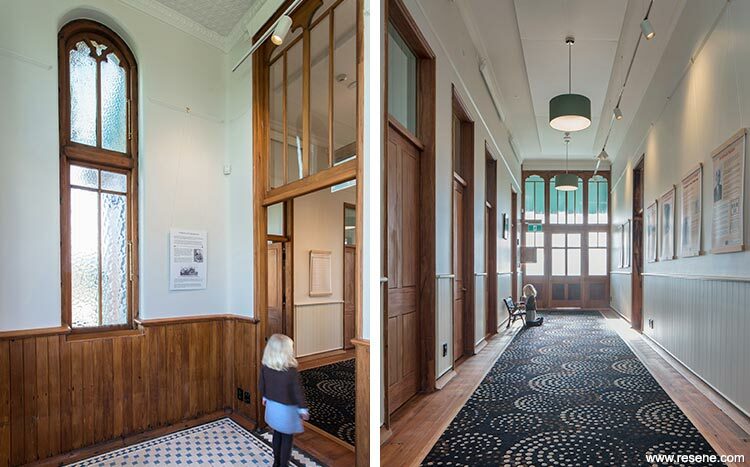 The second stage in was the fitout of the building as the Ministry for Culture and Heritage’s Education Centre. 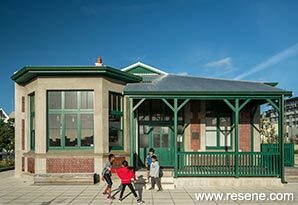 The crèche is a host to school groups from around the region, and country, who come to learn about the National War Memorial precinct, New Zealand’s role in wars, and local history. The building retains its original layout, and many details. These are the source of the paint and finishes colour strategy. Externally, a traditional green paint, Resene Burnham in Resene Enamacryl gloss and Resene Lumbersider low sheen, was chosen to give the building street presence, and to contrast with the red brick and grey plaster. The internal colours are lighter, softer versions of these colours that delicately highlight the internal ceilings, timbers and glazing. The street façade has a traditional religious appearance, with gothic windows, crenelated parapet, and religious symbols. The front door opens into a formal porch, with original tiled floor. From here, the main central corridor runs the length of the building to the back door that leads out to the veranda, and back garden. The four main rooms, and toilets and storage all open off this corridor. The walls were finished in solid plaster, and have the unusual detail of curved corners. The plaster also curves simply into the door frames, rather than having architraves. The timber skirting has an unusual curved profile, and also follows the curve of the room in the corners. The spaces are high, and well lit, with over-lights on every door. The main space was known as the ‘play room’, and is now the main teaching room. The former ‘sleeping room’ is now the research room. Externally, the strategy was for the crèche to look similar to when it was new. Heritage photos showed the brick and plaster, while paint scrapings showed a dark green paint on windows, trims and the rear veranda. Photos also showed a fence which was replicated. 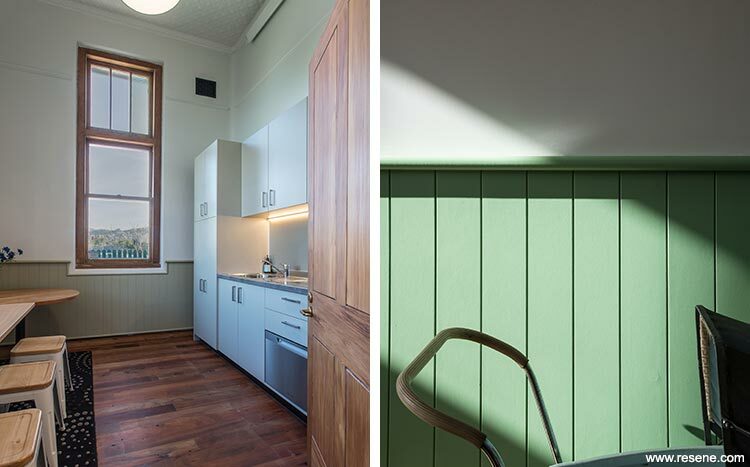 A new green colour was chosen that is a modern take on take on the original shade. Internally there was little photographic evidence of original finishes and colours. There was evidence of a dado, possibly made of canvas on the wall of the teaching room, and linoleum on the floor. Paint scrapings seemed to indicate that the walls were initially white, while internal door leaves, door frames, skirtings, and the interior of windows were all clear finished. The heritage status of the building led to a strategy of simplicity that puts the emphasis on the spaces rather than the new work. Resene White Pointer was chosen as a soft warm neutral throughout to provide a base for the display areas. The hall was deliberately kept neutral to emphasise the lovely proportions, and to act as a joining space between the rooms. Here the dado and dado rail are also Resene White Pointer, but the different gloss levels and textures give definition. Colour was added to the new dados, soft furnishings, and light fittings, in the teaching rooms, staff, and offices to give life and individuality to each individual space. 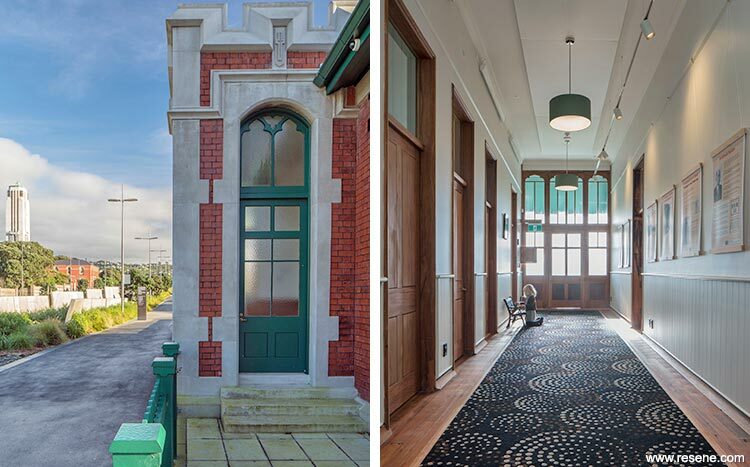 The colours – Resene Amulet, Resene Joanna, Resene High Tea and Resene Hillary, were chosen based on muted versions of the exterior colours – the red brick, grey plaster, and green trim, then teamed with Resene Sea Fog on ceilings throughout. The new kitchen cabinetry is conceived as a stand-alone installation within the room to avoid conflict with the heritage features. To avoid dominating the space, the materials selected tone with the wall and dado colour, keeping the emphasis on the natural timbers, and the views of the park. The warmth of natural timber is picked up by the patterns on the dark carpet. Together the browns give a pleasing contrast with the light walls, which allows the soft dado colours to glow. The main challenge was to insert a new fitout to suit a new use without overwhelming the heritage fabric and spaces. Although there is a lovely thick Axminster carpet, it is set in from the walls in a timber border. This keeps the original timber floor as a uniting element throughout the crèche interior while encouraging students to sit on the carpet. One heritage principle is the reversibility of new work. The dados are conceived as discrete panels set on the walls, rather than a continuous band. This keeps them clear of the feature round corners, and also makes them easily removable. The dados are tough, fire rated cement board and can take the knocks of furniture, bags and general use. It is easy to repaint a panel if required. Another challenge that came with unknowns was that the initial proposal was for repainting the doors, windows and skirtings. However, as they had been painted over the original oil, the substrate was considered in poor condition for painting, and the decision was made to strip them back. This added extra cost to the project, and also required a decision about how well to strip and sand the doors; how much damage should they show?